Wars always generate stories and everybody loves a story. 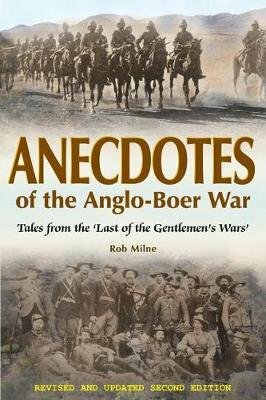 Rob Milne has compiled this selection of Anglo-Boer War stories from all over South Africa and recounts them in a book that saddens, mystifies, but most of all entertains. There's the devotion of the English fiancee who for 60 years sent a sprig of heather to the Chrissiesmeer Post Office for her beloved's grave; the tale of the lone Boer sniper who held off the entire Guards Brigade for more than a day after the battle of Bergendal; the story of the soldier who, caught illegally bayoneting a sheep, looked severely at the prostrate beast and remarked, "That'll teach you to try and bite a British soldier!" Read about Sergeant Woodward's two graves in Heidelberg, and the ghosts of the British officers that still haunt the Elands river valley. During the past 12 years since the publication of the first edition of this book, Milne has relentlessly followed up on his stories and sometimes the stories have followed him ... with unexpected results! There's a photo of the ghosts of the Bergendal farm girl and her British soldier lover who appeared in broad daylight on the battlefield while Milne was investigating the story in 2011. There's the unnamed Welshman who found the long-lost British paymaster's gold 60 years after the military train was ambushed and looted near Greylingstad. Learn the truth of how Churchill and his fellow officers received the daily war news in Morse code while they were prisoners of war in the State Model School in Pretoria; why Prime Minister Botha was sued after the war for stealing the 'Kruger Millions' when entrusted to his care as Commandant-General during the retreat to the Mozambican border. And there's the love story, 'The Legend of the Flowers', about Martha, a Boer girl, and a British soldier, George, which unfolded in Ventersdorp and how Martha involved the author in her story from beyond the grave. A unique and delightfully refreshing read.